The popular name Las Vegas comes from the Spanish term “meadows” or the grassland meadow. 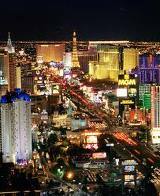 The city is situated in Nevada at the Western United States. It was discovered in the year 1829 by the league of Mexican merchants spearheaded by Antonio Arnijo when they arrived at the grassland meadow as they journeyed to Los Angeles. In the year 1855, a small group of Mormon missionaries from the Salt Lake City was sent in the area to educate the native Indian settlers in cultivating the land for farming. They built a fort and created a way station in between Los Angles and Salt Lake City. This was the beginning of the non-Indian period. As the years went by and the population had become fast increasing, Las Vegas was officially established in the year 1902 with the initial population of 800 people. As a fast growing city, it was estimated that in each month, four thousand to eight thousand are moving in. Tourism, gaming or gambling was born as the city grows popularly. Las Vegas allures and attracts many tourists not only as the city entertainment facilities but also of enjoyment and satisfactions of all especially to those who love nightlife. If you are looking for a better place to spend most of your time, Vegas has its great accommodations for visitors especially in summer months. Yes it’s true that summer makes your day frustrating because of the blistering heat of the sun. Pools are the primary options like Hard Rock Hotel pool and many others. The month of June, July and August it is the best summer month of Vegas. Enjoying the best book you have in the travel, sipping favorite cocktails, and sitting in the side of the pool sounds great and relaxing. If you are a person with great interest in entertainment shows, the whole year round is yours to visit Vegas. However, if you are a gambler the best month for you is opening weekends of March Madness—the Super Bowl. If you want have a good night during that summer visit, Casinos like in Stratosphere Hotel Casino is the best choice. Or visit entertainment shows every night as much as you like in the whole night of your travel. Get lots of surprises in the fascinating and spectacular Bellagio Fountains located at the Las Vegas Boulevard in front of Bellagio Hotel Casino. Furthermore, if you like to have a superb experience to these marvelous sightseeing creations in the city Las Vegas has it all for you.